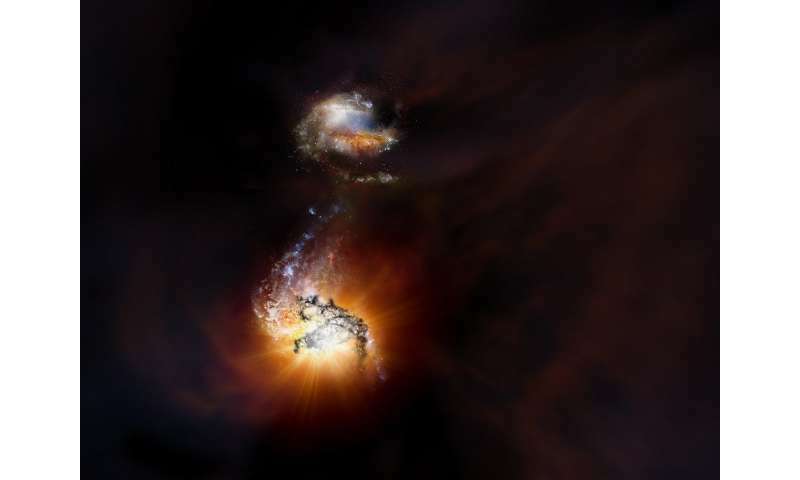 New observations with the Atacama Large Millimeter/submillimeter Array (ALMA) have uncovered the never-before-seen close encounter between two astoundingly bright and spectacularly massive galaxies in the early universe. These so-called hyper-luminous starburst galaxies are exceedingly rare at this epoch of cosmic history—near the time when galaxies first formed—and may represent one of the most-extreme examples of violent star formation ever observed. The galaxies—which would appear as flat, rotating disks—are brimming with extremely bright and massive blue stars. Most of this intense starlight, however, never makes it out of the galaxies themselves; there is simply too much obscuring interstellar dust in each. When will these charlatans ever learn? This is neither collision nor merger, as the Big Bamg fantasists would have you believe, but, rather the catastrophic energy release from a recombination of two discrete layers of oppositely-charged intergalactic plasma, which was triggered turbuence introduced by the passage or a GR*/STP**! Federation's UltraDreadnaught Class Battle Ship through the sector. If one views the "Artist's Conception" of the event, the pulverized wreckage of the ship is plainly visible, especially so in the lower portion of the frame, as the portion of the debris field created by the massive spacecraft's demise is well-illuminated by the visible light discharge of energy consequent upon the recombination of the plasma layers. It is likely nearby and not nearly as bright as they claim. The object has an intrinsic red-shift, claims of red-shift=distance was falsified decades ago. However, if astrophysicists ignore the right people and particular data thry can continue with their fanciful fearie tales of the Big Bang creation stories. What the Devil does that have to do with the catastrophic energy release of recombining plasma double-layers, canthide? The redshift of this pair is entirely irrelevant, as is the Big Bang, since --there they are. The redshift of this pair is entirely irrelevant, as is the Big Bang, since --there they are. "We report the detection of ADFS-27, a dusty, starbursting major merger at a redshift of z = 5.655, using the Atacama Large Millimeter/submillimeter Array (ALMA). 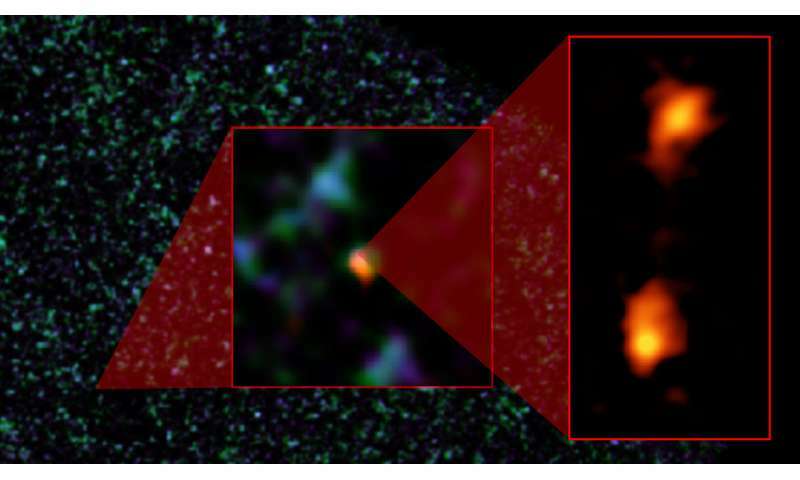 ADFS-27 was selected from Herschel/Spectral and Photometric Imaging Receiver (SPIRE) and APEX/LABOCA data as an extremely red "870 �Ľm riser", demonstrating the utility of this technique to identify some of the highest-redshift dusty galaxies." Gravitational red-shifting in tired light models could clear up many of the confusing observations held so dear by the merger maniacs. There have been examples where such an explanation fits much better than the fairy tale. Still, the community refuses to extend the alternate explanation to other observations for a fit check. What a crock. That still has exactly zero to do with the spectacular energy release of recombining plasma double layers. Besides, a Steady State universe isn't the same as a STATIC one, even if it does sidestep the whole issue of origins, right? Therefore, there has been -absolutely verifiably- about fifty years for this pair of galaxies to travel towards or away from us, unless this just happened yesterday, of course. All your blather about redshift and Big Bangs just detracts from the main point- every last phenom in the universe is plasma. Well, then, tuxford --why don't you get right on that? I'm sure your browbeaten colleagues would appreciate the help, not to mention having someone so graciously "take the heat", as they say. I'll bet they would nominate you for a Nobel Prize! just detracts from the main point- every last phenom in the universe is plasma. Now that's just silly, only 99.9% of the phenomena in the Universe is driven by plasma processes. C *Lambda_Emitted/Lambda_Observed and the velocity of this wavelet may be +/-, and the magnitude of 0 to infinity . Not limited by the constant c. Therefore, suggest we view the universe with logic, not nonsense! Nobel's have no basis or logic in Theoretical Physics. ""Our current observations indicate that these two galaxies are indeed producing stars at a breakneck pace,..."
I wish they would all stop this; the galaxies are not "producing" stars, they have "produced stars", as billions of years have passed and the galaxy at this time is almost certainly inactive and populated by mostly dead and dying stars. At 12.7 bly away this galaxy was peaking before the Milky Way was even finished. I know they always phrase in the present tense, because it is the present, for us, but that is not accurate and really doesn't add anything of value to the content. Scientists say they insist on precision, how about showing some more in the writings? Not sure any of this makes sense until you define the time arrow of the observed.